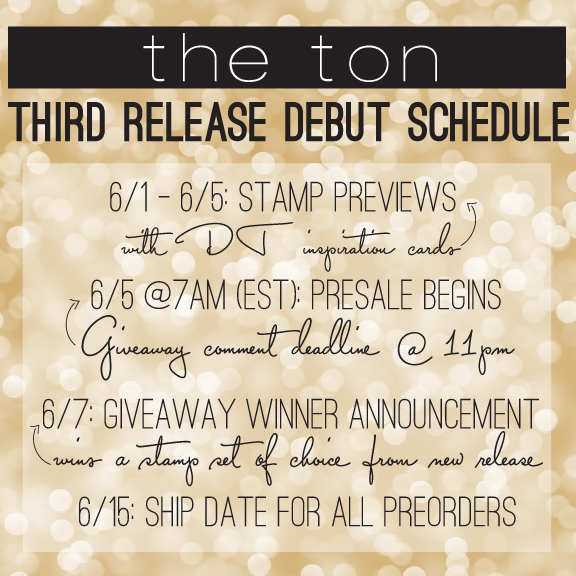 Welcome to day 5 of The Ton’s third release. 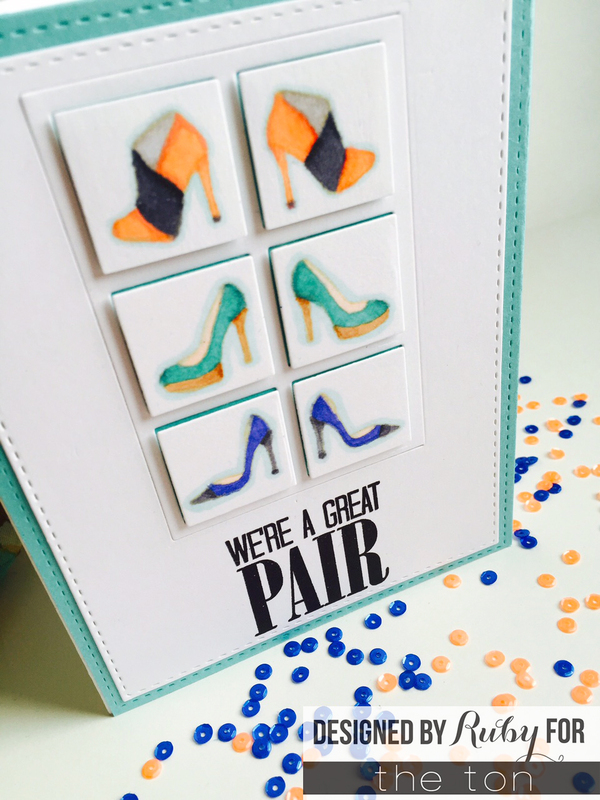 Today, we are showing cards featuring Shoe Wardrobe 2nd Edition in Solid and Outline stamp sets. Be sure to comment on earlier posts to increase your chances of winning a stamp set: Day 1 Wild Peonies, Peony Garden, and Get it Girl; Day 2 Mini Wild Florals and I Got You; Day 3 Pyrotechnics, and Day 4 Heart Diamonds. You can start placing your preorders today, with estimated shipping date of June 15. I think these stamps are definitely worth the wait! ♥ Stop by other Design Team members Jessica and Mayline’s blogs for details on their cards. I have three cards for you today, using both Shoe Wardobe stamp sets. The styles and angles of the shoes in these sets are different from the first edition and still pair really well with them. For my first card, I wanted to do something very basic. I love black and white combination paired with another bold color. It gives it such a nice contrast. The background is from a black and white patterned paper pad I have. The frame die is from Paper Smooches Fancy Frames Icons Dies. I die-cut the frames with both black and white cardstock so that the white part can be where I stamp the shoes and the black part becomes the frame. I also die-cut the frame using double-sided foam sheet for, guess what–dimension! 😉 I used the black inner piece, cut off the little scallop and stamped the sentiment on it with Versamark and heat embossed with white embossing powder. I added some matching enamel dots. I’m really glad that I have been practicing different styles and I love how this came out. And from this angle. Don’t you love the details on the shoes? They are incredible! The pink shoes have a double layer – so the design on top can be stamped in different color or even glitter! My second card is something new to me. I have been watching other crafters try this no-line coloring, including Copic markers. I was surprised you could use them with an image stamped with distress ink. Of course, I chose these really small shoes to practice my no-line Copic coloring, lol. What do you think? It was pretty hard to take photos, and I will try this with different white cardstock. I feel like it looks a little abstract/artistic. It almost looks like it’s watercolored. I had an idea in my head of how I wanted this to look on a card, and I’m pleased at how it turned out. The coral/gray pair: E02, R22, R24, C5, C7, N0, W1, W3, and W7. The teal/beige pair: BG13, BG18, E00, E33, and E37. The blue/black pair: B66, B69, C7, C9, and E00. Shadow for all three: BG10. The window panel die cut is from Mama Elephant’s Peek a Frame Creative Cuts. I die-cut white cardstock slightly smaller than size A2 and then with the window panel die. I stamped all the shoes, using some masking, with Antique Linen on each panel. I colored them with Copics and set them aside. I took the sentiment “we’re a great pair” from one of the Shoe Wardobe 2nd Edition sets and used my MISTI to stamp it with a black dye ink. I used the MISTI because I wanted to make sure I got a crisp look without having to mess up. I placed the shoe panels back in their place with foam tape for dimension, because, well, I kinda love dimension on all my cards. I took a lot of pictures so you can see the coloring. For some reason, it didn’t come out too crisp…but that gives it an artistic look, I hope?!? I added it on top of this beautiful Papertrey Ink cardstock in Hawaiian Shores that I just got yesterday! Okay, my last card was the result of an idea I had… it didn’t come out exactly as I wanted, but it’s close enough. Neat and Tangled carries a pretty cool box die, but I don’t have it. So I created my own box! Here’s a look at how I started. I used kraft cardstock for the box and scored some lines, did some cutting…and folded to create this look. I stamped one of the shoes on a small square, colored in with Copic markers, and added gem dots on top. The tissue paper behind it was die-cut with Pretty Pink Posh’s Peek-a-Boo die. 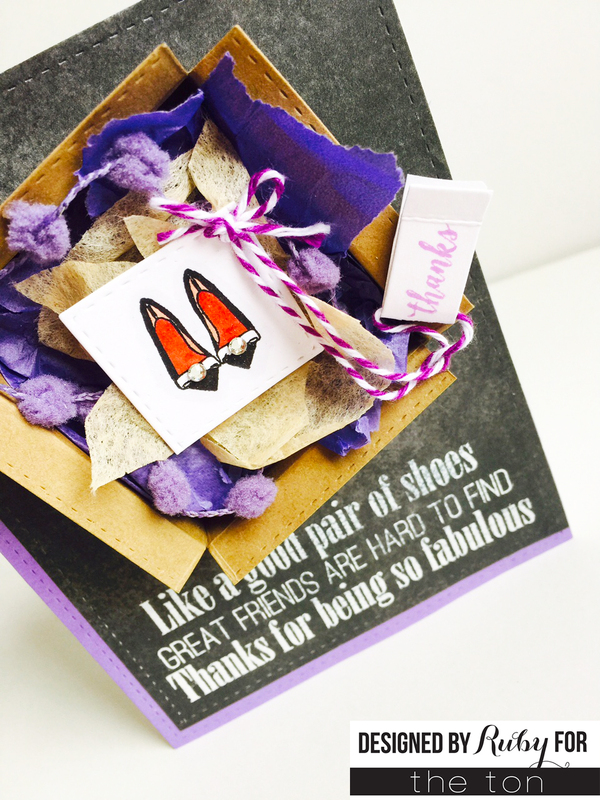 I arranged the ‘shoe box’ over the tissue paper and used glossy accents to stick it. Then I added some purple tissue paper behind that to add more color. I arranged all of that inside the box. I closed the outside of the box with gold washi tape, adding some Scor-Tape to secure it well. I added some twine and a tag, stamped with the word ‘thanks’ from Vintage Frames set. I stamped the large sentiment with VersaMark on a smoky black patterned paper and heat embossed it with white embossing powder. I die-cut A2 size purple cardstock and added it behind it. I arranged the box above the sentiment and taped it down with Scor-Tape. Closer look at the box and it’s contents. Who wouldn’t love to receive this as a gift?! 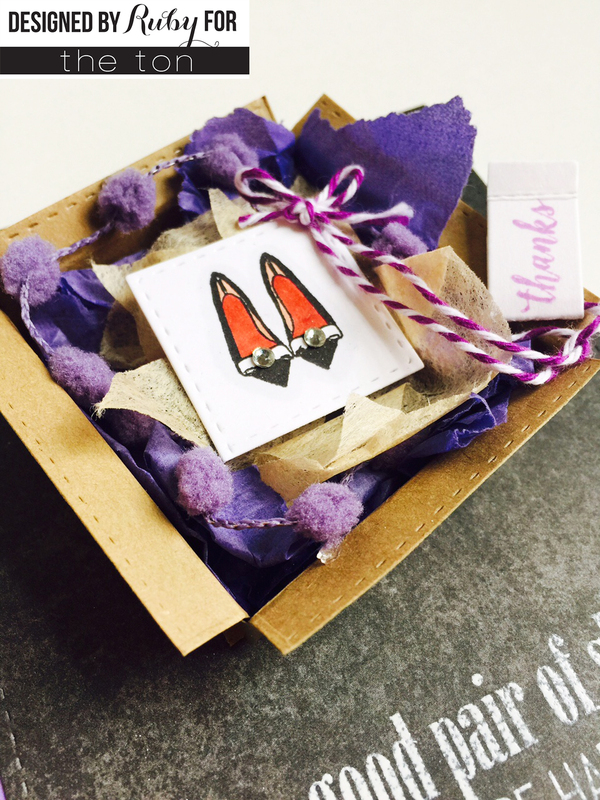 All of these shoe themed cards are adorable but oh my gosh….the last one in the box is amazing! How fun this would be to receive! seriously you are a genius! LOVE the box! Ack! What fun projects, Team!!! Love the we are a pair card. The colorful shoes rock! The design is also fab! gorgeous!! i love the purple/red and that nifty box!